Hurrah! A finished project – this quilt is made from the fabrics in Riley Blake’s Seaside collection that came out this summer. It’s one of my favorite recent collections and made for such a good summer project. I especially love the scrappy combination of stars. This quilt is a throw/lap size – perfect size for a picnic or a night of star gazing, or if you’re like me: a much needed nap. In the end, it took me slightly longer than I had planned – such is the nature of summer. (Why do I ever think I’ll crank something out quickly in the summer? One of these day’s I’ll learn.) At least we’re in for a few more weeks of good weather around here, so we’ll put it to some outdoor use. I especially love the plaid on the back and the cheerful bias stripes for the binding. The quilting on this one was done by Melissa of Sew Shabby Quilting. She is a professional long-arm machine quilter. Her prices are amazing and her completion time is generally around one week! I wanted just a simple, all over stipple for this quilt but she offers so much more. She has many fabulous ‘computerized’ pattern options available to choose from, and she can do amazing customized work as well. Melissa is also offering a 30% off discount on any quilting if you mention “Diary of a Quilter’. That is a screamin’ deal – even in you’re shipping from far away! In addition to completing the quilt itself, the pattern is finally finished as well. The pattern includes instructions for the original throw size (72″ x 72″) as well as twin, queen, and king size versions. The pattern is available for instant download or in my etsy shop. Fabric requirements are given in the pattern listing. 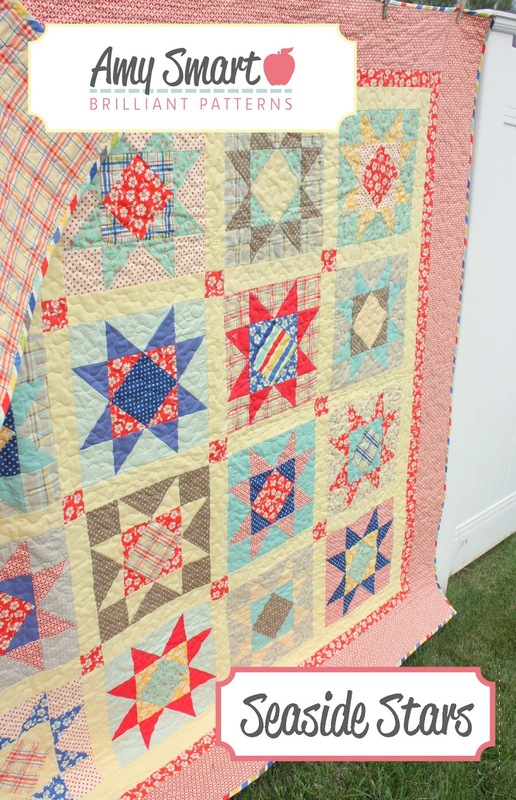 In addition to the pattern, Randi at Fresh Squeezed Fabric has created kits for this quilt! The kits include everything you need (except the backing yardage) to make the throw sized version like mine. Kits available here as well as yardage from the Seaside collection. (Post Edit: Kits are sold out, but some yardage is still available. Seaside is also available at Fabricworm, and Fat Quarter Shop. Linking up to Sew and Tell with Amylouwho! Love it!!! Seaside is such a gorgeous collection, and the pattern works perfectly with it! What a cute quilt! I love the fabric. I just ordered a fq bundle of seaside today!! Thanks for the inspiration! Beautiful! Love the colors you put together. So very summery! Well you certainly did it justice! Gray pattern Amy! It&#39;s amazing how different all the star blocks look but really the are all exactly the same. Oops! &quot;Great&quot; pattern I meant. You made really nice fabric combinations with the stars! Fantastic quilt, Amy! One of the best of 2012! It has my vote. Can you tell I just adore it? Lovely quilt! I am so fond of stars, and love how you did these! And I agree, Seaside is one of my favorite collections to come out this summer! I love love love what you&#39;ve made!! Patten is going on my bday list! Beautiful quilt! I always love stars. I think I will pick this pattern up for me. Oh, that is just so beautiful. I just love, love, love it! Beautiful quilt, Amy!!! You did a great job and I LOVE the Seaside collection!! Gorgeous quilt- and I can personally vouch for Melissa@ sewshabbyquilting.com … she is my &quot;go to&quot; for the most awesome, professional &amp; artistic quilting I have come by. Gorgeous new pattern Amy. Love your Crystal stars. The different backgrounds make your quilt so stunning! Really beautiful. Love the colors. So pretty. I love the combination of summery fabrics. So beautiful! Love, love, love stars lately! It looks gorgeous Amy!I love your styled photos, they bring me to the beach :)Thank you for sharing! Might have to send something off to Melissa. Pretty pattern Amy!